The astonishing and unprecedented series of Atlantic storms which have been battering Britain since January show no sign of abating with Wednesday seeing the most damaging weather system to date. Wind speeds were recorded at over ninety miles per hour at nearby Mumbles Head causing structural damage and yet more flooding across Wales and the south west of England. Fortunately we seem to have escaped the worst of it once again but at work I watched in a state of morbid fascination as the wind began to tear the roof off our neighbouring office building. In the end it managed to hold on but just across the road a large conifer fell crushing beneath it some unfortunate residents car. Needless to say opportunities to get outside have been limited with last weekend a total washout, so the appearance of some sun yesterday came as welcome relief. Unfortunately I was at work, as is often the case, but aren't these sort of situations exactly what annual leave was made for? 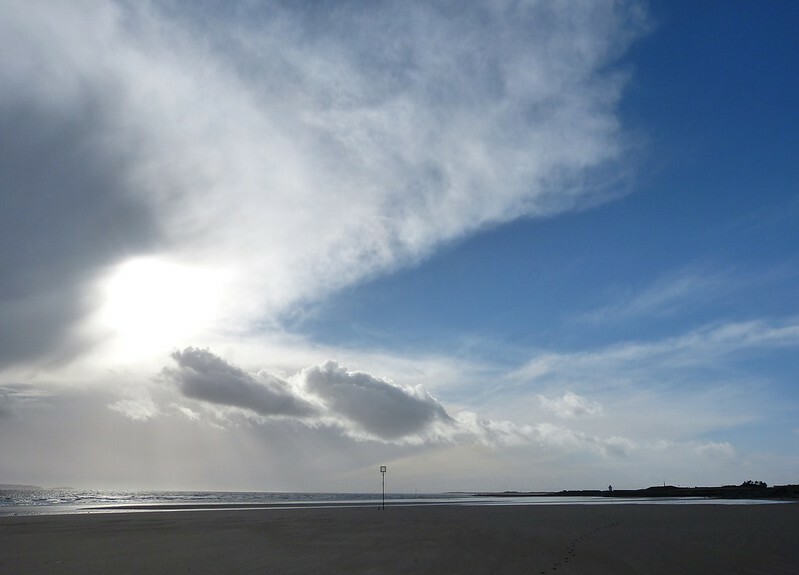 An hour later and I was walking towards a very windswept Burry Port and feeling all the better for it. Cool as conditions were it felt wonderful to be back out in the fresh air as I set about examining what is a substantially changed landscape from my last visit. As at Port Eynon relentless wave action has stripped the beach of much of its sand leaving clay substrate exposed over large areas. 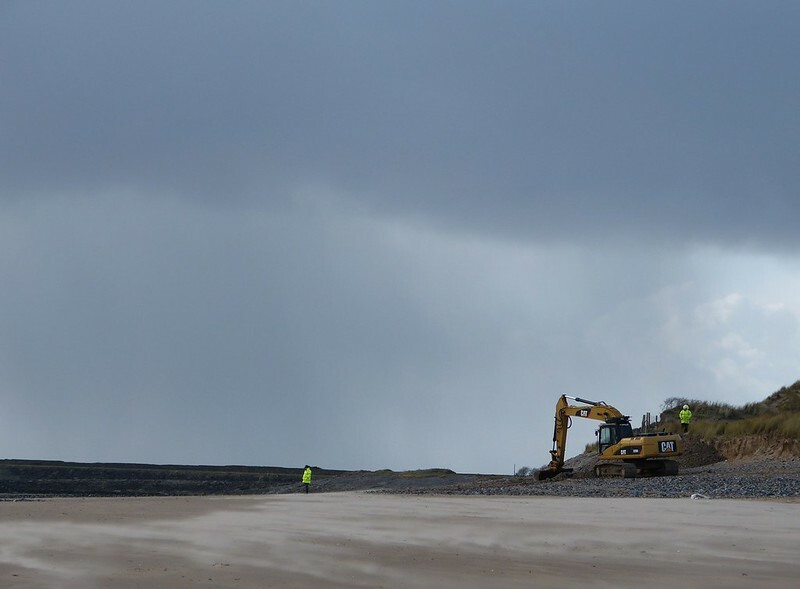 Meanwhile the main channel has been deepened yet further and the breakwater east of Pembrey harbour (seen above) has suffered several large areas of damage. As these structures are a legacy of more prosperous times for the port it's debatable if they will ever be repaired making their documentation all the more important. 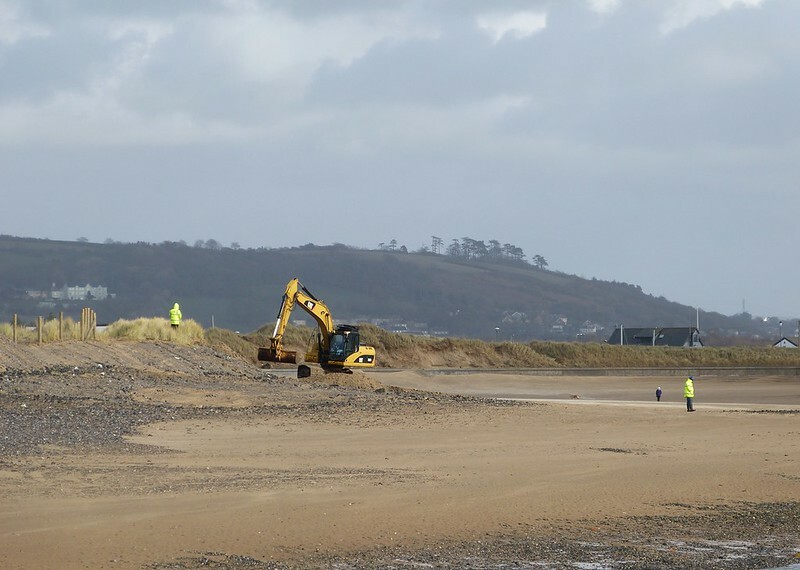 Further along the local council is being forced into action, however temporary, where successive storm surges have broken through the sand dunes threatening the village and caravan park beyond. Looking to the east all appeared peaceful as they worked but behind me another storm was barrelling up the Burry. 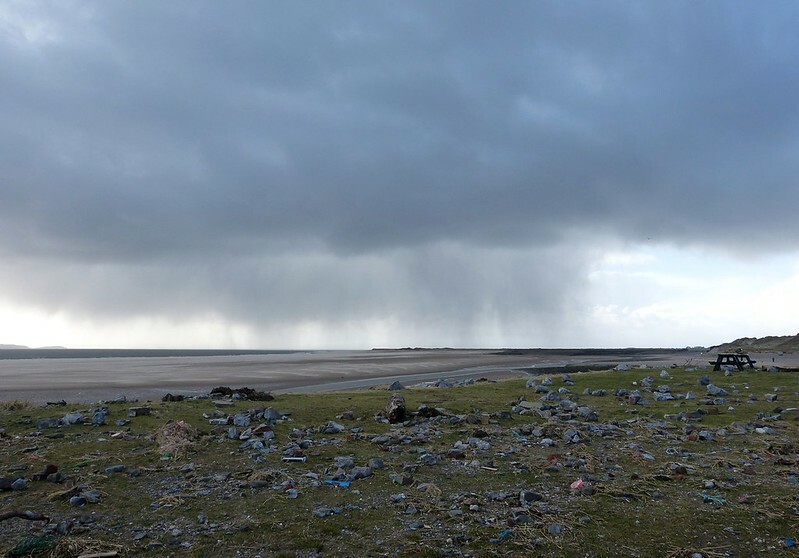 To my relief the worst of that particular system passed me by and I was treated to a brief volley of hailstones as I surveyed yet more destruction out towards the lighthouse. 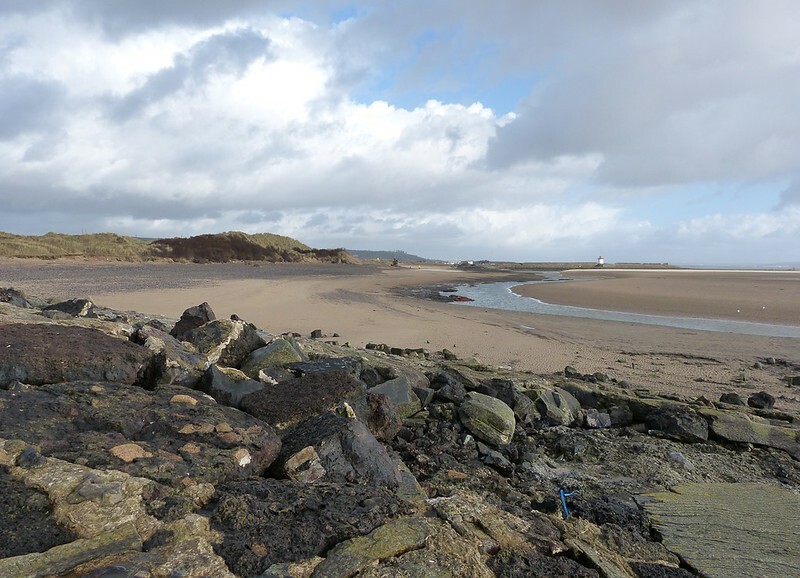 Here what used to be an area of grassland is now strewn with large rocks and debris, much of which used to form a protective barrier against the sea. I'm not sure anyone will be having a picnic here in the near future. Of course through all of this our wildlife has had to find a way to survive and it was a relief to find good bird numbers still present. There were no Brent Geese this time around (the tide was probably too far out anyway) but at least ten Ringed Plover, three Redshank and a smattering of Oystercatchers had taken their place. Even better though were a noisy flock of Linnets, my first of the year. In Burry Port harbour itself I had been hoping for a wayward duck or two but found only a couple of Mute Swans and a rather smart Common Gull. Better luck was to be had along the east beach where a male Red-breasted Merganser flew in catching the sunlight beautifully as it did so. A Great Crested Grebe was spotted not far away before I just had to capture the passing of another storm. Talk about mixed weather. Moving further along the beach I realised that this was the first time I have ever walked this particular stretch as usually I take the coastal footpath which routes much further inland. And what had I been missing! Other than a few dog walkers and several hundred Oystercatchers I had the place to myself with excellent views across the water to Gower and whatever goodies may have been taking shelter. 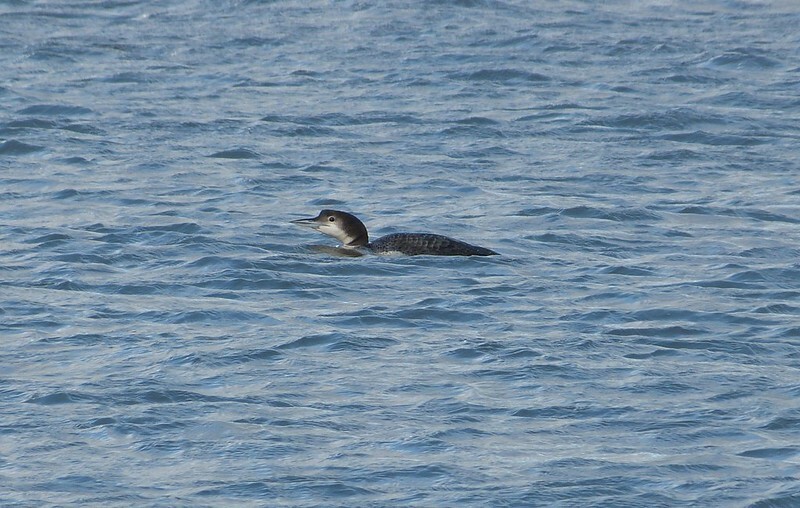 Obviously Divers sprang to mind as I know a couple have been seen here in recent weeks but even so I was completely taken aback when a stonking Great Northern Diver popped up just offshore. We shared a disbelieving glance for a few seconds before it dived and I regained my senses and whipped out the camera. It resurfaced at an inevitably greater distance but even so the resulting photograph is one of the my best of this brutish bird. It continued to feed while I watched, catching small fish on a couple of occasions, but I just couldn't take my eyes off that beak. On Mull these are almost two a penny at times but are often seen at distance and in very bright conditions (it's always glorious on Mull for us) so these exceptional views really were a treat. Eventually I moved on and upon arrival at the dredging pier was amazed to spot another Great Northern Diver heading straight for me. Given its position I'm almost sure this was a different bird which tripled my previous count for the species in these waters. If anything these second views were even better due to calmer water though it didn't stay around for long. Another two male Red-breasted Mergansers and a Great Crested Grebe were also present here but they were easily outshone by a lone female Goldeneye. 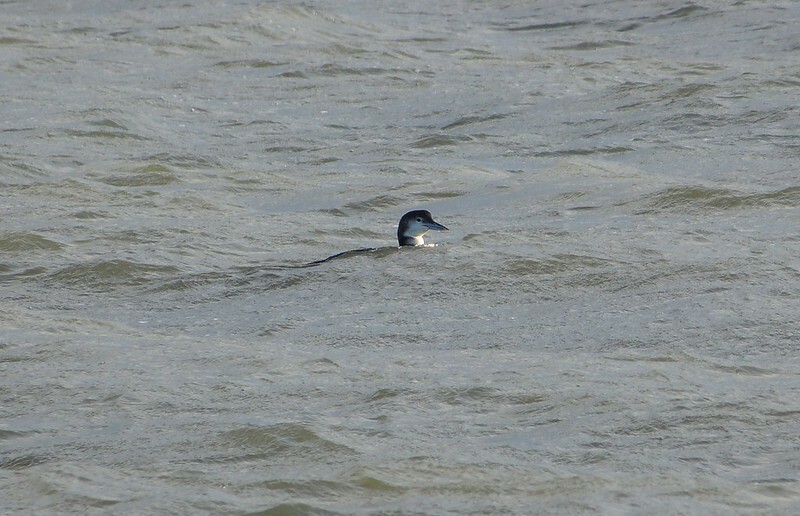 She looked to be on a mission and swam strongly from the direction of Llanelli, past me and out into more open water. A long overdue Burry tick. Having had such success I continued scanning but other than a startled Curlew that was about it. Or so I thought. Cutting back along the main path with the rising tide having prevented any more beach walking I spotted a Sparrowhawk flying through the trees and a single Little Grebe. Not a bad way to finish off what had been a most productive few hours. Work is a necessary evil...I often think we have set up a horrible system of survival. Glad the storms are settling down some, its been a wild sort of winter here too...The Great Northern Diver, a great find! !